Today’s breakfast – a typical work day breakfast at my desk actually… juice, milk, an apple, oatmeal, a yogurt, and 4 peanut butter…kidding! 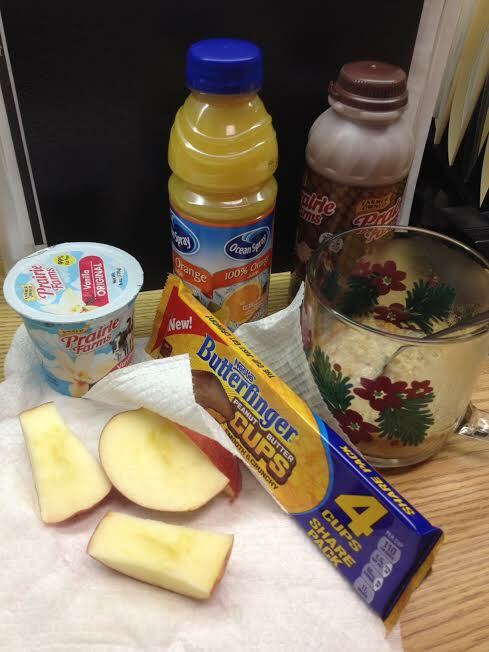 I didn’t eat the butterfinger cups for breakfast, but I did eat them later as a snack! Saw them advertised last night and made a mental note to try them, and there they were on the counter at the gas station this morning. Yum! Yum! And don’t you dare make fun of my oatmeal mug! Yes, it’s a Christmas mug, but I love that thing!